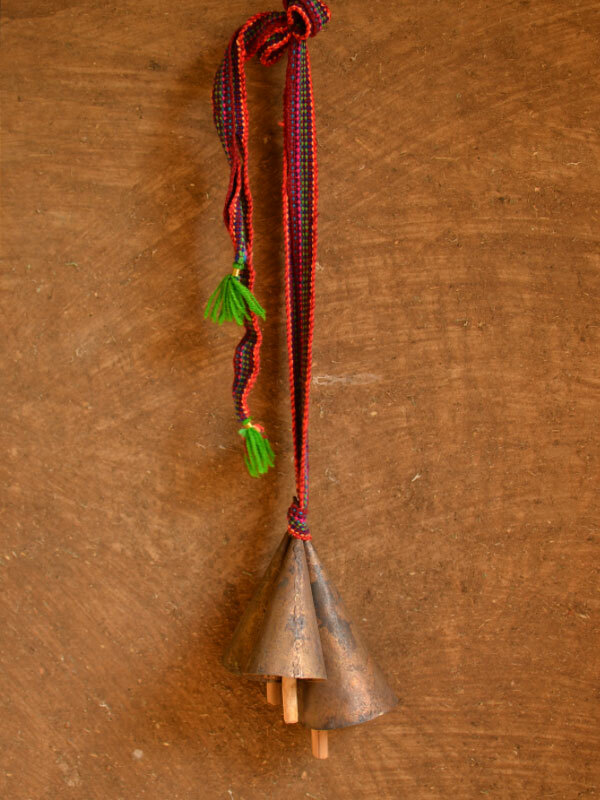 About Product : Hailing from the Banni Grasslands of Kutch these bells will soon fill nature’s music in your living spaces. Handcrafted by artisans of Kutch to ornament their ruminants, the beautiful sound and their earthy presence will remind you of being close to our villages and our roots. “Godhuli”… long shadows of dusk, a cloud of dust covering the orange horizon and the sounds of tinkering bells, announcing that the cattle is returning home. Our villages have always had a strong relationship with animals, be it for farming or cattle raising. There are festivals especially for animals, such as Govardhan Puja, or Camel races, cattle fairs, special decoration for cattle as well as some crafts which are made just for the purpose of decorating or identifying cattle, such as embroidered decorations for camels, foot jewellery and tattoos. 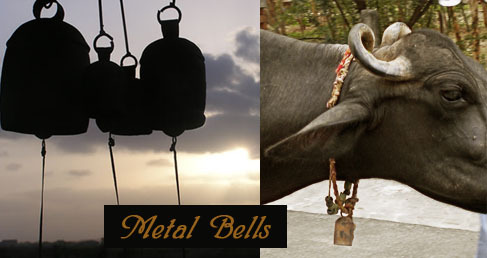 One such craft which originated with cattle rearing is the craft of metal bells, or “Ghantadi”, as known locally in Kutchh, Gujarat (India). 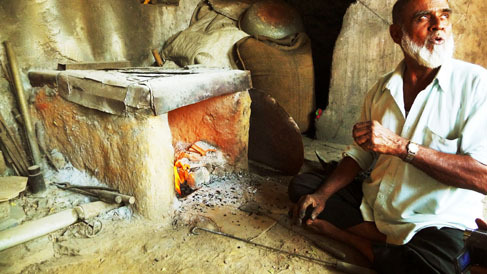 The craft is believed to be over a thousand years old, originated in Sindh, (currently in Pakistan). These bells were used to identify cattle. They were tied around the cattle’s neck so the owner would know of their whereabouts. 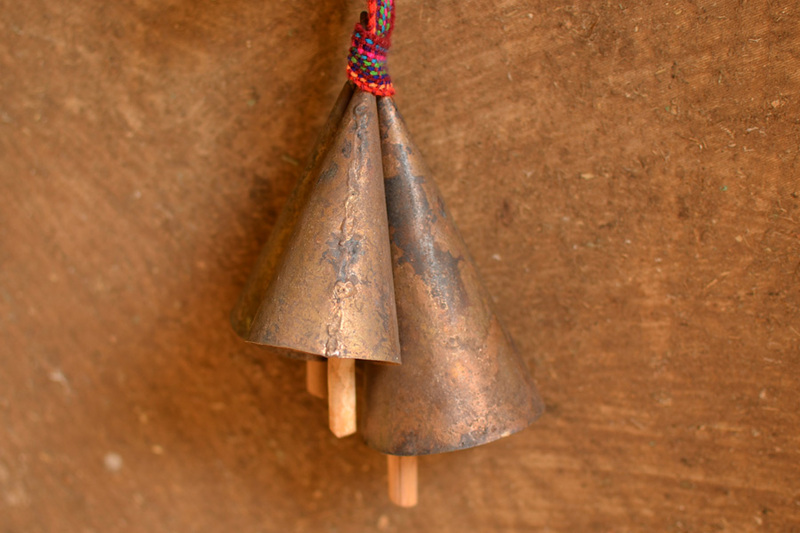 The makers of these bells are from the Lohar caste in Kutch and according to some of them, their families have been making bells for as far back as they can trace their ancestry. There are thirteen sizes of bells and they are customized for different animals. A goat would have a small bell with a high pitched sound, while a cow would have a larger one with a deeper note. 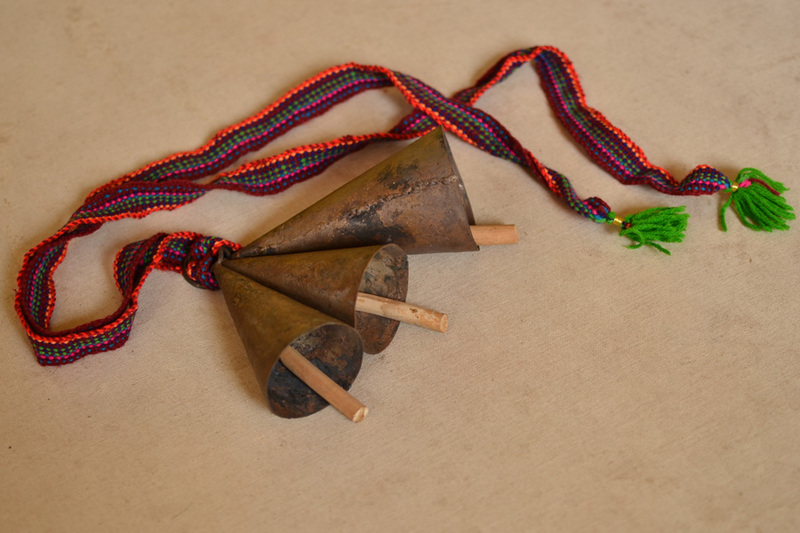 Even in the same size, the bells are customized with different sounds, or notes, to differentiate between cattle belonging to different owners. In each size, upto five or six different notes can be made. The bell is made of iron and coated primarily with copper, along with a few other metals. They are made from scrap iron sheets which are repeatedly beaten to join together and to give them the required shape. The metal parts are neatly joined by expert hands by a locking system without any kind of welding. 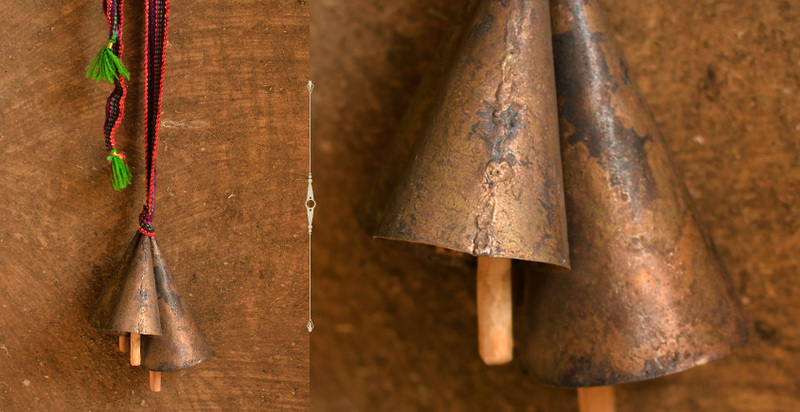 Then they are coated with powdered copper with the help of mud paste and then heated in a furnace to fix the powdered copper on the surface of the bells. Once cooled and ready, a wooden piece is attached to the centre of the bell for that characteristic sound which is beautifully sonorous. 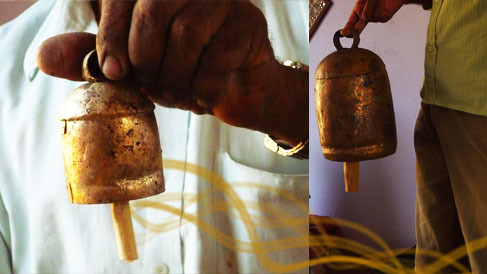 Denting of the bell to get the perfect pitch is also done by hand, by repeated beating with a hammer. It takes a lot of expertise and very careful and sensitive use of sound as well as touch. 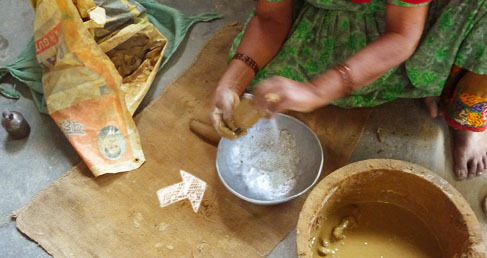 Bell making in Kutch is a wonderfully sustainable craft as the raw material is metal scrap which is purchased from junk yards and the only use of energy is in the furnace for preparing them. Even the waste generated is miniscule, comprising of small metal scrap and burnt mud. Nowadays, this craft is gaining popularity as decorative items not just because they have a beautiful sound, but also because those sounds remind us of being close to the earth, the villages and our roots.